The New Year seems to be a time when most people start evaluating ways that they can live happier, richer, and healthier lives. I've joined a group of 30 other bloggers that have come together to help you do just that... in a more natural way! 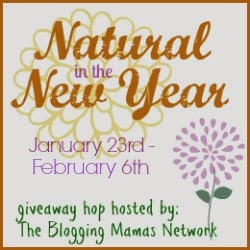 Each blog in the linky below has a natural prize to give away worth at least $25! So, join us all by going more Natural in the New Year! When you begin looking into cloth diapering, you may find that you are being told that you need a TON of accessories. In time, you'll likely discover that some of these-while quite nice to have- aren't absolutely necessary to successfully cloth diaper. In my opinion, wet bags are not one of these- they are awesome! 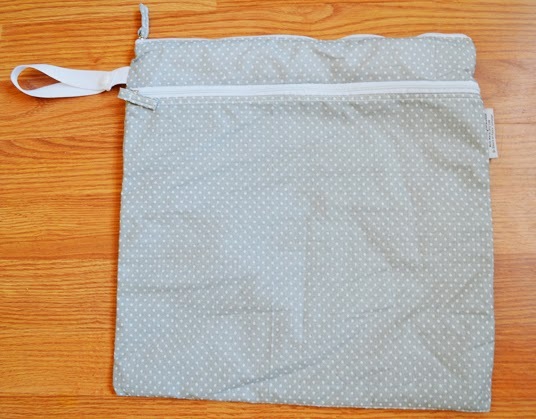 For those brand new to cloth diapering, wet bags (or soiled bags as my son prefers to call them) are bags featuring some type of waterproof lining to store your wet diapers in until laundry day. You just toss them in the bag after each change to keep the smell at bay (and your diaper bag dry when you're on the go). Personally, we have four and find that to be a good number for us...two smaller ones for the diaper bag, and two larger ones for the house. This allows us to have one available for travel and one available for home at all times, even when the others are in the wash. You might find four to be excessive, or you might find you need more, but chances are you're going to want at least one...but where do you buy a good one? Last month I shared with you all about the super adorable cloth diapers from Buttons Diapers. After using ours for a bit, these quickly become a favorite in our stash. But did you know they now also make wet bags? They do! And they were kind enough to send me their large wet bag in Pebble for review. First of all, let's talk about how absolutely adorable they are! They are available in both Pebble and Apple, with a cute little polka dot print. Both colors are perfectly gender neutral. One of the things I most liked about our Buttons diapers was that simple, cute style...this certainly carries over into the wet bags! I will admit however, I was a little bummed to see that they did not feature the adorable little button embroidery that I loved so much on the diapers. Still, I love the style and actually think this might be our favorite of the wet bags we have so far! As I said, I received the large bag, which according to their website can hold up to six diapers (though I personally found it could hold more). They are also available in medium and small, so there is a size to fit all your needs. 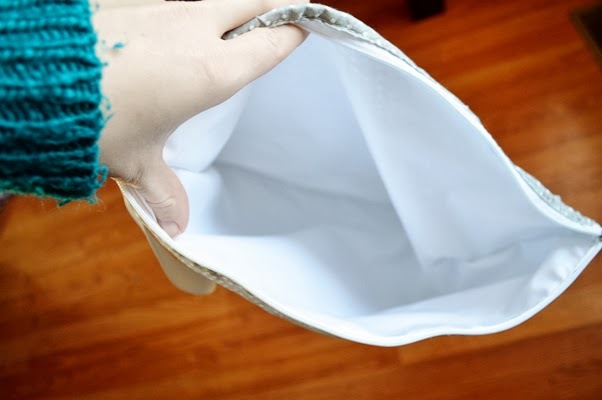 One of the things I like most about the large size, is that it is actually a wet/dry bag- meaning it has a zippered pocket in front so you can toss in a few clean diapers. I've found that these are particularly nice when on the go...rather than lugging a huge diaper bag into a public restroom, you can carry everything you need in the one bag! So much easier! Of course if you prefer a large diaper bag, this folds up easily and compactly so you can do so. The waterproof lining is the same high quality, durable PUL that I loved about the diapers as well. It features a convenient hanging loop so you can hang it on your changing table, bathroom door, etc. easily. At just $16 for the largest bag, they are a great value too. The small bag (holding two diapers) is just $7...very inexpensive and perfect for short trips to the store! And to make it an even better deal, wet bags can last far beyond your cloth diapering days. They come in handy for days at the pool, messy eaters and in case of accidents once your little one is potty trained! So much cuter, and environmentally friendly than a plastic sack for soiled clothes, right? Winner will be contacted via e-mail after giveaway ends, and will have 48 hours to respond before a new winner is chosen. One entry per household, winning entry will be verified. Odds of winning depend on valid entries received. A Modern Day Fairy Tale is not responsible for prize delivery. So Easy Being Green, Viva Veltoro, the Blogging Mamas Network, and the Natural in the New Year participating bloggers are not responsible for sponsors who do not fulfill prize obligations. I would love to get a medium wet bag and a new diaper cover. I'd get a tangerine diaper cover and a pack of nighttime inserts. I'd get some flushable bamboo liners, along with extra inserts. I have three of their covers that I won from another giveaway. I will get a couple of diaper covers if I win. I'd get the Cotton Flannel Wipes. I like the lavender cover. If I won I think I would get the Lavender Diaper Cover and then I would also get some diaper inserts! It is a very nice color! I would get a diaper cover in pebble and some inserts. I want the large wet/dry bag. I think I'd get a Blueberry cover and some inserts! I would get a couple 3-packs of Buttons' daytime inserts. I'd get a small wet bag, a diaper cover and some inserts! Looks like I could afford both a cover and some inserts. Would probably use the gift card on the one size cover in blueberry and some inserts. Either a cover & some inserts or a Large wet bag. we really need one! I would get some covers... probably Blueberry and Lavender! I would get some covers in Apple and Lavendar! I would get a cover in lavender and a cover in blueberry. I would probably get a Lavender cover and maybe two large daytime inserts. I would definitely get a banana cream diaper cover! I would get a banana cream cover and a 3 pack of large daytime inserts. I will get the Diaper Cover One Size Lavender. I would get a pebble and a sweet pea cover.